Wooden Doll House With Furniture is a wonderful play house for your little ones dolls and imagination. Safe, strong and beautifully made this two-story doll house has sliding front doors, working green shutters and many more features. 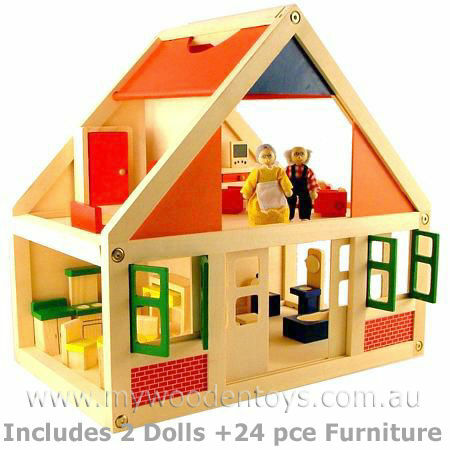 The Doll House comes with twenty four pieces of furniture and two grandparent bendable dolls. It has an open plan design, with a centre dividing wall to separate the rooms, so it can be played with from the front and both sides. Wonderfully finished this dolls house has lovely smooth surfaces. This toy is sure to become the centre of your child's playtime. We were thrilled to find this Doll House complete with four rooms of furniture and two dolls at such a reasonable price. We are very proud to present it in our shop. Size: 43cm wide by 27cm deep. From base to roof top 40cm. Dolls are 9cm high. We like this because: "A lovely, colourful and clever design. We like a toy that comes with everything." Delivery was fast, only a few days after ordering. Thanks!